Shop our collection of Magnetic Ribbon Boxes and change the way you showcase your precious items, from bracelets, rings to pendants & necklaces. These paper boxes are perfect for packaging & retail jewelry sales! 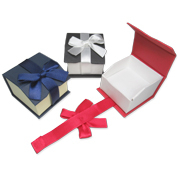 The closing system is easy to use & the bright ribbon has an elegant feel to it. Get the best deals thanks to our wholesale discounts!